Wood gates can be such a problem for most home owners when they are always dragging the ground and falling apart. 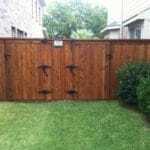 Please allow us to help fix this issue with proper bracing and or a metal frame we will install you a gate that will last a lifetime. At DFW we set all gate hinge post and latch posts 3 ' deep. 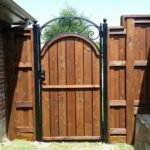 Our Wood frame gates are made custom to each specific job. 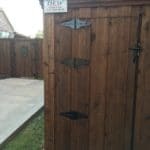 To build the proper wood frame gate we suggest an all Western Red Cedar rough cut 2x4 as the cross bracing and horizontal runners Western Red Cedar is less likely to warp ow bow in the Texas heat. All of our wood gates are assembled with 3" deck screws not nail. Wood gates with metal tube frames a great investment. These gates are long lasting a swing with ease. We use .095 wall 1 5/8" galvanized tubing that is welded together and attached to the wood frame 2x4's with 3" Lag Bolts. 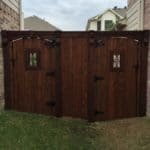 Below are a few of the many wood gates we have created for our clients across the Dallas /Fort Worth Area.